I am a classically trained piano teacher. I have a Master's degree in music from Kazan State University, Russia. 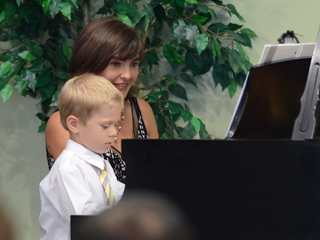 I have taught piano to children and adults for 15 years and have always loved it. Music is my passion! I have taught beginner, intermediate, and advanced levels of piano. I always ask the student's opinion before choosing a piece that he or she is going to play. I always try to make the lesson as fun for the student as possible. I will work very hard to make sure that your child has a very enjoyable and memorable experience learning to play the piano. In my teaching, I emphasize the student's expression of music. Even a simple song can create a mood. That is why during my classes I pay a lot of attention to the character of the piece the student plays. Every class is a tiny miracle of creation. I hope that all of my students have only pleasant memories of their musical childhood. Music is the art that connects together the past and the future, national and international, individuality and universality. People from all over the world understand the language of music. Music is much more important in human life than it sometimes seems. Since I am now a member of Music Teachers National Association my students have an opportunity to participate in various competitions. You can see their achievements here. Browse my website for more information about my work and me. My contact information is here. Download printable version of my Studio Handbook and Policies.